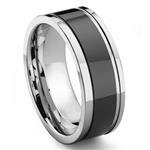 Another bold looking wedding ring made in black and gunmetal color tungsten carbide. 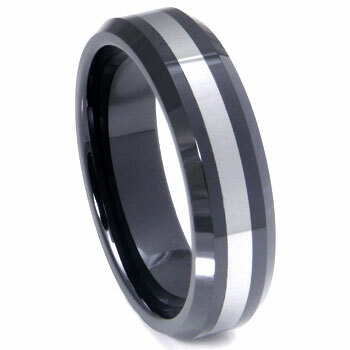 This ring is black with a gunmetal colored stripe in the middle of the flat part. 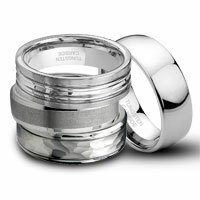 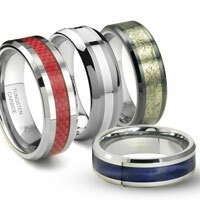 It has beveled edges and the whole ring is finished in high polish finish. 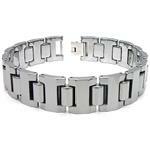 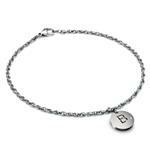 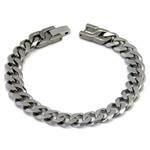 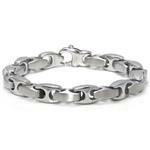 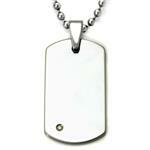 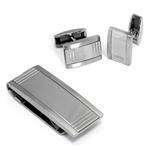 For those look like contemporary men's jewelry, go with the black trend. 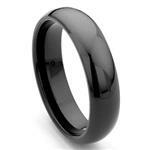 The durability of black tungsten of this ring is unmatched by gold or even stainless steel jewelry. 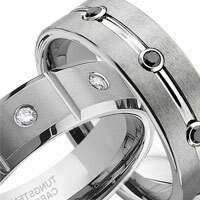 Both the black rhodium on gold jewelry or the black ionic plating on stainless steel jewelry will eventually scratch off. 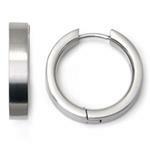 The black part of this ring is not created with plating and it is a solid black ring all the way through. 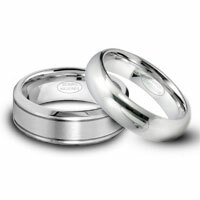 This ring is also offered in reversed coloring.